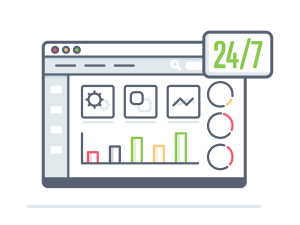 Facilitating product fulfillment services via our 24/7 web based system is a seamless process; you will benefit from the latest technology to make it easy as well as give you more time to run your business. At 3PL Center, our in-house IT team has developed web based fulfillment software at the core of our operations. Our web based system is designed to keep our clients “in the loop” while their shipments are being moved to their final customers. Why Should You Choose 3PL Center for 24/7 Web Based System? At 3PL Center, we have a combined experience of more than 45 years, and are constantly enhancing the fulfillment software that we have developed. We make sure our software is extremely easy to use. That’s why we do not focus on impressing our users with animated layouts and fancy buttons. We keep it simple and straightforward so that every customer can find it intuitive to operate our cloud-based system for their business. The information you seek will always be presented in a way that makes sense. All you need is a decent Internet connection and a computer to access our web based fulfillment software. Yes, no fancy gadgets needed! What’s more, our software is secure and reliable. You can rest assured that our network is shielded by more than one dedicated firewall; includes round-the-clock surveillance technology. In addition, our data center features redundant network connections too. Our 24/7 web based order fulfillment system is suitable for a wide range of professionals, including large-scale global manufacturers and small-sized retailers. You can be sure that 3PL Center serves all its customers with an unmatched level of dedication and passion. What’s more, our experienced customer service team is available round the clock to give you complete peace of mind. Ready to Get Started with 24/7 Web Based System? If you wish to know how our 24/7 web based system works, do not hesitate to contact us via email at sales@3plcenter.com or phone call at 732-391-2500 today.